Search for the sculpture capitol of the world on a map and you could find yourself pointing to the Black Hills. Already home to the world’s two largest outdoor sculptures, Crazy Horse and Mt. Rushmore, the Black Hills is now also home to the largest privately funded public art project underway in the United States – aka: The Sculpture Project: Passage of Wind and Water. The 21 granite hunks spread along two sides of Main Street Square in downtown Rapid City will begin to come to life this June when stone sculptor Masayuki Nagase starts carving them on site. Nagase will continue to work during the summer months over the next three to five years until the project is complete. 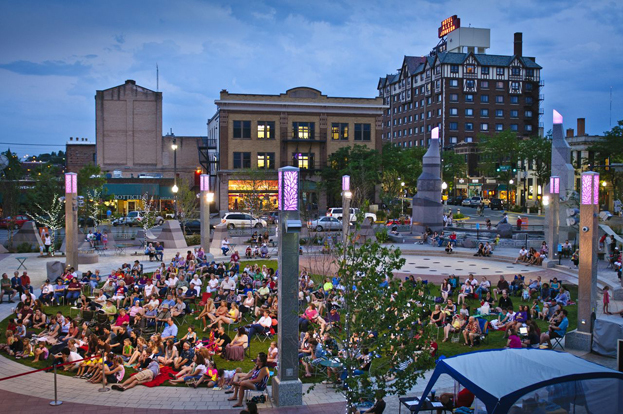 The Square’s landscape architect included the granite pieces in his plan with the intention of creating a major public art project and as a tribute to the region’s important sculptural tradition. The architect arranged the stones in two series that he called “garden tapestries.” The reddish granite along Main Street reflects the Badlands, the grey stones along Sixth Street reflect the Black Hills. Two 35-foot-high spires stand side by side at the gardens’ intersection, symbolizing Rapid City’s position at the nexus of the two geological formations. Earlier this month, the sculptor, Nagase, wrapped up a “community design workshop” tour to gather input before he begins carving. The artist met with nearly 600 people of all ages and backgrounds in small groups in Rapid City, on Pine Ridge, in Hill City, and Spearfish over ten days. Nagase lives in California, is originally from Japan, trained at the Academy of Fine Arts in Tokyo and has worked internationally as a stone sculptor for over 30 years. Everyone who attended the workshops had the opportunity to interact with a world-class sculptor on a personal level. Yuki left behind a fan club starter kit. During the workshops, Nagase talked about his past work and his vision for the project in Main Street Square. He also did a lot of listening. For artistic inspiration, he asked people to talk and write about their connection to nature in the Black Hills and Badlands. Turns out we all love to talk about our relationship to nature around here. Nagase took it all in and added the information to his already prodigious knowledge about the Black Hills and Badlands, which, in turn, has informed his design concept for the granite at Main Street Square. Nagase will incorporate input from the workshops into his final design for The Sculpture Project: Passage of Wind and Water. The artist’s work always centers on natural elements. For the Main Street Square project his visual design themes are wind for the Badlands garden and water the Black Hills garden. Through low-relief carving, he will abstractly depict the impact of these natural forces on the region’s landscape and inhabitants through history. His overarching theme for the project is transformation and the idea that all beings in nature aspire for balance. Nagase views public art as an opportunity to develop connections among community members, space and art. He has plans for further community design workshops, developing and funding an artists-in-the-schools program in several Rapid City elementary schools, and holding an open studio at the Dahl Arts Center. Passage of Wind and Water is a rich addition to our region’s sculptural legacy. The project joins Crazy Horse and Mt. Rushmore as a catalyst for meaningful dialogue about our shared values in the Black Hills community. The Rapid City project also breaks new ground for public sculpture in our region. As we watch Nagase’s work unfold, he wants us to be able to touch it, get to know him, give our input and in the end have a major work of art in our community’s living room – Main Street Square – that is a tribute to us and our community past, present and future. Anna is the community arts coordinator for The Sculpture Project: Passage of Wind and Water and works for Destination Rapid City. She and her husband, Stewart, have been raising their two children in the glorious Black Hills for the last 12 years. The family loves to be outdoors biking, skiing, climbing, hiking, riding, swimming and sometimes just sitting still. Anna’s background is in journalism with a focus on women’s sports. Most People Have No Idea This Rare Attraction in Hill City Exists!